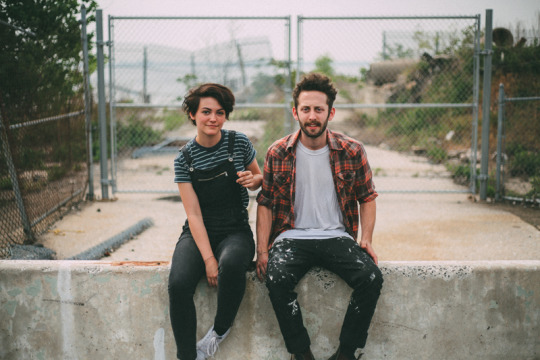 New Paltz, New York’s Diet Cig is Alex Luciano (guitar) and Noah Bowman (drums), and together the duo strips pop-punk infectiousness to its core of melancholic romanticism and tearful insecurities. Their music plays like the heartbeat of your daily inner dialogue; candidly expressing anxieties, fears, and hopes often in the course of a single song. “Sleep Talk” is the a-side of an upcoming 7” from Father/Daughter Records and Art Is Hard, and never before has a song’s title been more apt. Straightforward, open, and intimately honest, Luciano’s lyrics like “I can’t play instruments very well and I’ll eat all of your cereal,” feel deeply confessional as if confided from the safety of one’s bedroom’s enclosure, like the events of one restless night’s racing thoughts. Catch them on tour locally 9/25 at Mahall’s in Lakewood Ohio with Sheer Mag (!!!!!! SWOON !!!) and 9/26 at Spirit in Pittsburgh.